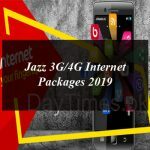 Jazz is offering the 4G internet WiFi devices with the continuous connectivity of internet to its users. The telecom operator is offering the 4G internet WiFi devices including Wingle with WiFi and USB Stick with the high speed of 4G internet connectivity in affordable monthly charges. Now there is a great offer for those customers who are not using their Jazz 4G WiFi Devices including the Jazz Super 4G WiFi and Jazz Super 4G Wingle. The telecom operator is offering the customers Welcome Back Offer. All those customers who have not used their Dongle sim from last 3 months or more are eligible to subscribe this offer. The cellular operator is offering the two 4G internet WiFi devices including the Jazz Super 4G WiFi and Jazz Super 4G Wingle. It runs on 2300 mAh battery and offers the 4G Speed upto 150 Mbps. The Jazz Super 4G WiFi can connect upto 12 WiFi Devices at the same time and supports microSD Card upto 32GB. Its setting is very easy just one tap setting through mobile app after plugin. It’s a sleek USB design device that you can connect with you laptop, PCs and Tablet to get the 4G Speed upto 150 Mbps. The Jazz Super 4G Wingle can connect upto 12 WiFi Devices at the same time and supports microSD Card upto 32GB. Its setting is very easy just one tap setting through mobile app after plugin. This offer is for those customers who have not used their Dongle sim from last 3 months or more. On the re-switching to their Jazz Super 4G WiFi Devices the customers can enjoy the 50GB of Data for the complete 30 days in just Rs.1000. The customers of Jazz Super 4G WiFi and Jazz Super 4G Wingle need to dial *117*70# from Jazz WiFi Device App or 192.1681.1.1 portal (USSD section) to avail the offer. How to check eligibility for the offer? The customers of Jazz Super 4G WiFi and Jazz Super 4G Wingle can check the eligibility for the offer by dialing *6363# and going to option 4; welcome back offer subscription details will be displayed only to eligible customers. This offer is only obtainable for MBB SIM (SC62) users, and not effective for Data Sim (SC18) customers. Users can have this offer multiple times during 90 days, inducement would be added and latest validity would be valid. Only eligible customers can avail this offer and have the notification on both MBB and OCN number. Reactivation offer details will be shared again on 90 Day + 30th, 60th and 80th day for client suitability. Jazz Super 4G WiFi Devices Welcome Back Offer is a once-off, and will not return automatically. Multiple subscriptions is allowed and the benefits will add and valid for 30 days only. Data allowance can be used on both 2G/3G/4G network subject to handset and network coverage. How to Avail Jazz+Warid WhatsApp & SMS Monthly Bundle?